As a Senior Staff Scientist at MSD LBNL and an Adjunct Associate Professor at MSE UC Berkeley, I lead a research team of Ph.D. students, postdocs and scientists at LBNL; and I also teach at MSE UC Berkeley. My group researches the physical and chemical processes of materials with a focus on materials transformations and dynamic phenomena at solid-liquid and solid-liquid-gas interfaces. 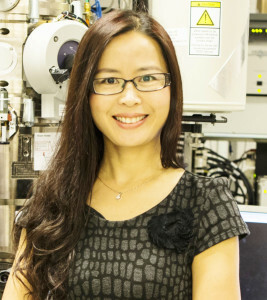 We enjoy the developing and applying in-situ environmental transmission electron microscopy (TEM) and using other complimentary techniques for our research. We are fortunate to have access to the state-of-art TEM, X-ray, nanofabrication, computing and other facilities at LBNL. We interact with scientists world-wide who have the most creative mind and we are open to collaborations and discussions with you ! Haimei leads discussions and reports on “In Situ and Extreme Environment” at NexTEM workshop, PNNL, Richland, WA, Oct. 8-10, 2018. Welcome postdoc Dr. Seungyong Lee join in the group! Sep. 2018.